2 Why Are Mantras Chanted in Sanskrit? Most of the mantras are in the Sanskrit language and have a mysterious aura associated with them. They seem to be far away from modern life. The rhythm and soothing vibrations created by the sound of the meditation mantras in Sanskrit end up charming and enchanting people in modern society. Depending on the type of Sanskrit mantra being recited, the person will gain various benefits. We will find the various benefits which can be brought about by reciting Sanskrit mantras and how to make them more effective. When mantras are chanted, they create energy-based sounds. The human body is made up of five elements according to the Indian metaphysical tradition. Sound is the first of the five elements. Vocal sounds have a meaning associated with them. Even when we are not aware of the meaning of the sound, it still has its impacts on us. Recitation of mantras for meditation can help in finding answers of the subconscious mind. Mantra should be repeated constantly, loudly at first and then as mental chanting. All languages and religions have mantras in them. For example, Christians chant the Ave Marie, Tibetians chant the mantra – Om Mani Padme Hum and OM. Why Are Mantras Chanted in Sanskrit? Sanskrit is an ancient language dating back to 3,500 BC and is considered as the origin of all Indo-European languages. It is a phonetic language and the sounds produced in the language create energy vibrations which can replace negative energy with positive energy. Chanting Sanskrit mantras provides the chanter with the energy accumulated over thousands of years from the Divine and also the millions of people who have chanted them over years. The words on the picture below is a famous sanskrit mantra Maha Mantra, which will be explained in the second part. Meaning: It is called as the sound of the universe or the first original vibration. It represents birth, death and re-birth as well. Benefits: The natural musical pitch of the Universe is 432 Hz at which the vibrations of the Om mantra occur. Hence, it is scientifically proven that chanting of the mantra OM brings the person in harmonic resonance with the Universe. It helps in calming the fluctuations of the mind, and is like yoga for the mind. 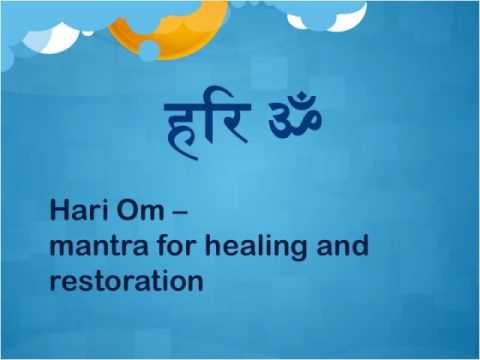 You can start and end a yoga session with chanting of OM. Meaning: It asks the Lord for blessing and protection. The Lord is asked for nourishing us, and giving us strength for working together for the benefit of humanity. Learning should be purposeful and brilliant and we should never go against each other. Benefits: This is one of the best mantras to begin a day, a new business or even a yoga class. It helps in bringing together the group without any competitiveness, with unity to work towards a common goal. Meaning: Blessings and protection are requested from the Elephant God, who is also known as the remover of obstacles. Benefits: Lord Ganesh is the God of wisdom, success and the destroyer of obstacles. It is helpful when a person is faced with challenges in life. Meaning: This mantra is a request to God, which asks Lord Krishna and the energy of Lord Krishna to engage us in His service. According to Vedic scriptures, this Maha Mantra has a lot of benefits. It liberates the chanter from cycle of birth and death, removes all anxieties and also brings ecstasy. When you chant the Maha Mantra, all other Vedic Mantras get included in it and benefits of all of them as well. It is not difficult to chant the Sanskrit Mantra, however, the chanter needs to follow instructions and follow some rules to get the maximum benefits from the mantras. The instructions given below should be followed when chanting the Sanskrit mantras. A mantra which creates the right kind of vibrations for you should be selected and never changed. Changing a mantra can cause problems in higher spiritual journey. It is easy for the mind to drift off to a dreamy state or some random thoughts. When a mala is used, this does not happen when you reach the head bead. You are reminded to turn the mala. It also acts as a physical anchor & connection to bring the chanter back to the physical world. A spot or place should be chosen to practice the chanting of the Sanskrit mantras and should be used always. This place becomes charged with energy over time and can get you into spontaneous meditation. When chanting mantras, the posture should involve sitting with an erect spine. The best asanas for this are Siddhasana and Padmasana in which the person can sit for a long time. When chanting the mantras, the breathing should occur from the left nostril predominantly or should be balanced. This is because the left nostril is associated with mental or lunar forces. It is important to practice chanting regularly, at a fixed time every day. You can chant for 10 rounds of the mala – 1080 times every day, and it will help in seeing progress in the benefits brought about by the mantra. Pronounce clearly: It can be difficult in reading the Sanskrit Mantra, and people might not pronounce the mantra properly. Due to this the benefits associated with the mantra cannot be achieved. Hence, they should be pronounced correctly. Meditate on the meaning of the mantra: Once you are aware of the meaning of the mantra, you can choose the mantra which is best for you. Hence known the meaning and associated benefits of the mantra before reciting. Repeat with a certain rhythm: A rhythm should be used when chanting the mantras. The rhythm should be in sync with breathing or should pulsate as you wish. Adjust your voice and your speed: Mantras should be recited audibly in the start, followed by a whisper and then silently. This method can be used by beginners as well. The speed of chanting should be comfortable for you. The slower the speed, the greater the power. The speed should also be determined on the state of mind at the time of chanting.